Hey folks! 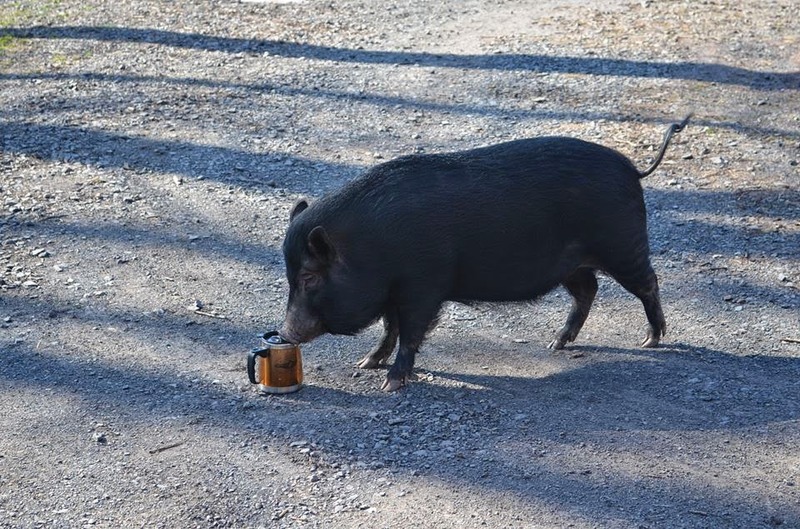 Very soon, I'll be organizing a small charity auction to benefit Pig Placement Network (a registered 501 (c)3 nonprofit organization), with the request that the money donated be used to help the homeless potbellied pigs being fostered at Ross Mill Farm & Piggy Camp. Ross Mill is currently home to 109 adoptable pigs, and they need everything from food, to medical care, to blankets and more! The auction will be held on my Facebook page starting June 23rd (rules and details to come later)! All polishes were custom-made for this event and will not be available outside the auction. Two bottles of each color have been made, but only one of each will ever be made available for purchase at the auction. The second bottle is my "swatch bottle," which will allow me to take promotional swatch photos without ruining the auction bottles. These swatch bottles will remain in my possession forever and will not be auctioned. To see the first custom polish I revealed, click HERE! To see the second, click HERE! To see the third, click HERE! The fourth polish I'd like to show you is Darling Diva Polish Teacups Are For Tea. 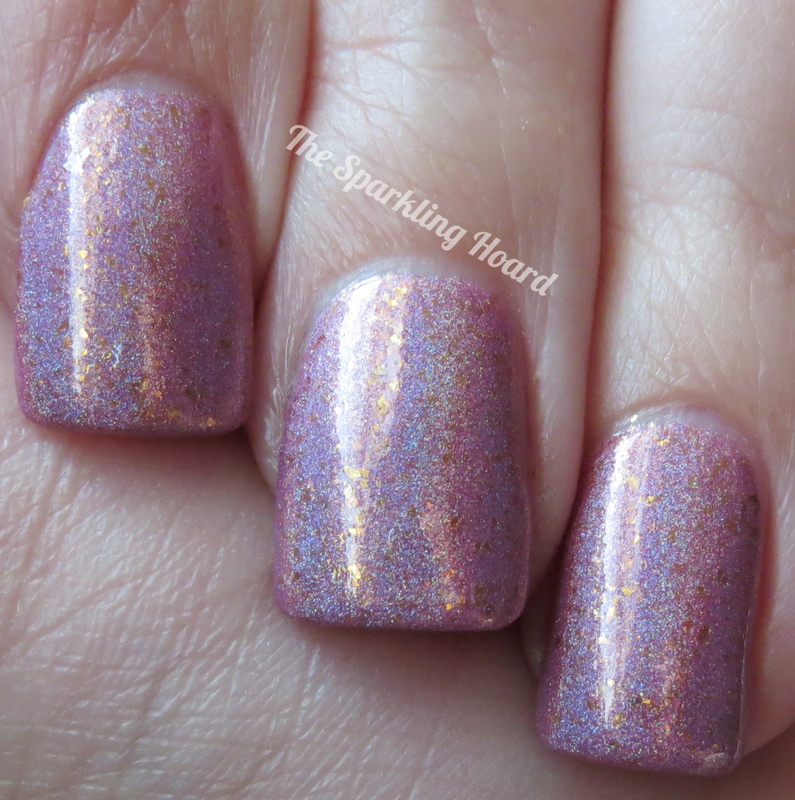 This is a light pink linear holographic polish packed with little gold flakies. The holographic effect is very strong and stunning in the sunlight, while the delicate gold flakies are enchanting in the shade. The formula is lovely. For best results, use 3 thin coats. Dry time was average. Check out this video of Teacups Are For Tea! Teacups Are For Tea was designed to look like those old-fashioned, gold-edged, floral pattern teacups. The only thing these teacups should be associated with is tea, but unfortunately, some shady individuals have decided to spread the lie of the "teacup pig." Dishonest breeders claim that they have created pigs that will get no bigger than 40 pounds or so (some make even more outrageous claims of 10 pound pigs), but it is all a lie. They show off tiny parents without disclosing the fact that pigs reach sexual maturity at a young age, and that the parents of the "teacup pigs" are not fully grown. Many piglets are removed from their mothers too early. The worst breeders will send buyers home with feeding instructions which will cause malnourishment. If these poor animals manage to survive to adulthood, they grow much bigger than their owners wanted them to be (60-175 pound potbellied pigs), so they are abandoned. Abandoned pigs have been left in the woods, at kill shelters, and even at meat packing plants. If they are lucky, they eventually find themselves in one of Pig Placement Network's foster homes. 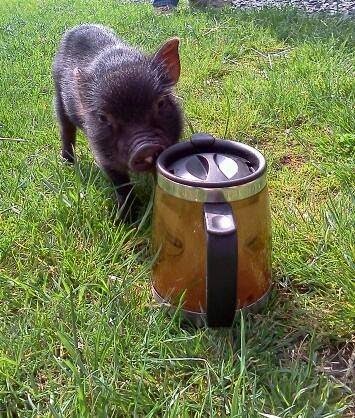 This is Louie, who was sold as a teacup pig. He was about as big as a cup back then! Two years later, he's much bigger than that cup! If you buy a "teacup pig," you're really going to end up with a potbellied pig! As you can see, the word "pig" should not be anywhere near the word "teacup." Teacups are for tea! Thanks to deceptive breeders and the ignorant people who impulsively buy pigs from them, Pig Placement Network's resources are stretched thin. Please help them out by participating in the polish auction next week! Want to see more cute pigs and learn about ways to help them? Be sure to Like Ross Mill Farm & Piggy Camp and Pig Placement Network on Facebook! To be kept updated on the auction, Like The Sparkling Hoard! And it sure wouldn't hurt to Like the lovely Darling Diva Polish, either! Auction bottle and swatch bottle both generously donated by Darling Diva Polish. 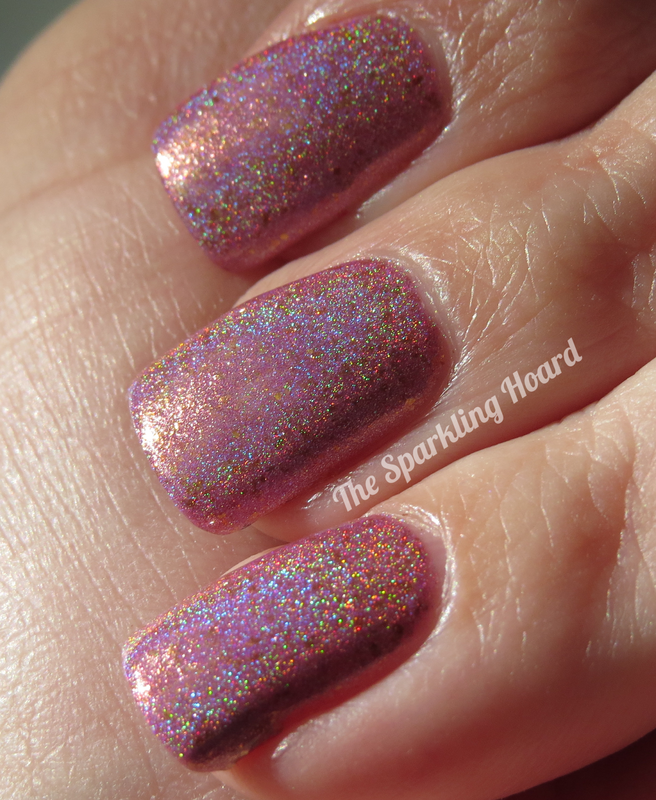 Such a gorgeous holo shade.